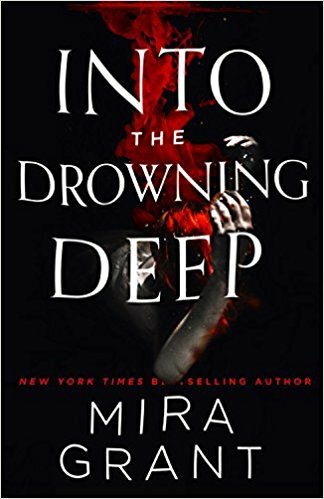 I am grateful that the back cover synopsis of Mira Grant’s Into the Drowning Deep is vague about the plot. I’m usually not a fan of creature horror, and had I known the antagonists were mythical sea beasts, I likely wouldn’t have cracked the spine. But I’m glad I did, because I absolutely loved this book. It is a page-burning horror cruise that generates terror through both claustrophobia and infinite space (more about that later). It begins with found footage of a documentary film crew searching for cryptids in the ocean (horror at sea and found footage—two of my favorite things!). But is the footage real, or simply a publicity stunt? Considering the impossibility of what appears on the film, and a conspiratorial public ready to scream “crisis actor” when confronted with visual evidence it doesn’t want to be true, it’s unclear whether or not the video is a hoax. Seven years later, a team is assembled aboard the Melusine to retrace the path of the doomed ship and return with answers to these questions. On board are dozens of scientists, a journalist (Olivia) and armed guards—and most notably, Tory, the sister of one of the victims of the earlier voyage. So how is Grant able to elicit both claustrophobic and infinite terror at once? The appeal of seafaring horror, for me, is that it captures the smallness we feel when confronted with the vastness of the universe. Like Bowie’s Major Tom, a threshold is crossed at which point help is not possible. Though the safety tethers aboard the Melusine are mostly psychological to begin with—radio contact, ornamental defense shields—when they are severed, the crew aboard the Melusine comes undone. Once the creatures have breached the deck the infinite is replaced by something equally menacing: the finite. Following the scientists as they navigate the levels of the ship (in particular Olivia’s ascent through a glorified laundry chute) is true white-knuckle reading. Thus far, this review has been quite vague—perhaps because I don’t want to reveal the monster component. Creature features only work when there is an element of social commentary, and Grant does a wonderful job of balancing a diverse cast of humans, creatures and their interactions without falling into the traps of cliché. The ship becomes its own floating ecosystem. Relationships begin, loved ones are lost and when the social bonds of the passengers break down, it becomes a microcosm of a society that no longer knows how to communicate with one another. For Tory and Olivia to survive and pursue their seafaring romance on land, they’ll need to overcome not only the threats of nature and sea, but also the voyage’s corporate sponsors and the other passengers. Grant is a gifted writer, and she knows how to draw us in and then break our hearts. She gets us to invest in her characters, and isn’t afraid to kill them off. The blood and gore are bountiful on this adventure, but it’s the characters who make this one of the best horror novels of the past few years.